I’ve been reading firearms blogs for awhile. Most of the ones I keep up with are long-established enterprises. For example TTAG has been around for quite a long time, and it shows. Even more so is gunfreezone.net. I’m at a loss to say how I discovered Miguel’s blog, but he’s been at it longer than TTAG, and the content is stellar. While he doesn’t have a staff like the bigger blogs, where GFZ shines through on (other than the epic name) is the unique perspective. 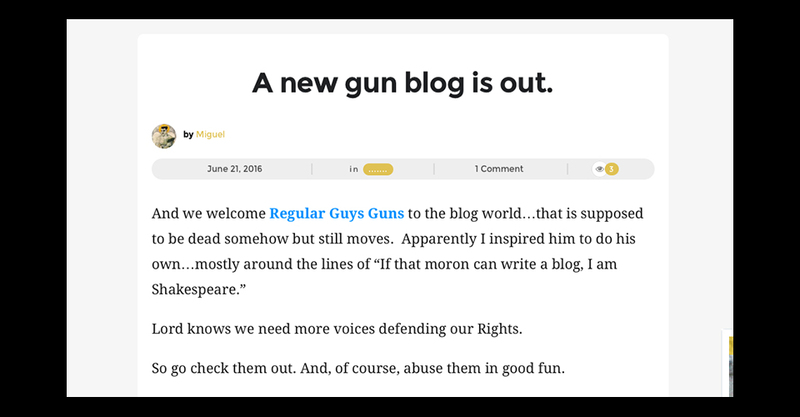 Miguel’s an immigrant to this great nation of ours, and his writing comes from the perspective of someone who grew up without the Second Amendment, but upon moving here, embraced that idea soundly. It’s the voice of experience. He knows what happens when the populace is disarmed, because he lived it. Originally when I thought about a gun blog, I was a bit dissuaded as the market seemed to have been spoken for. Stumbling upon GFZ gave me the idea for RGG. If GFZ has it’s unique perspective, and has established it’s longevity, I can do it as well. In the blogosphere as a whole, this is the whole idea. It isn’t about finding the one niche no one has covered, it’s about your unique perspective on whichever niche may be of interest. I finally took my own advice, and thus RGG came about. Thanks to Miguel and GFZ for the inspiration. I’ve listed him in the resources section. Make gunfreezone.net a regular stop on your travels. And yes, abuse away. In addition to being my voice in the world of firearms, it’s an experiment. Things may break, and I’ll learn something.